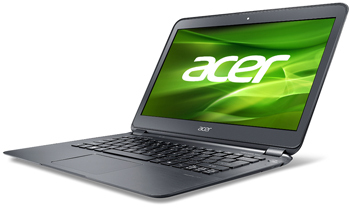 Acer has recently unveiled their latest Ultrabook called the new Aspire S5-391H74U. For now it has been said the device will be available in Japan for 150,000 Yen which is around $1905 from 25th of June. However, there has been no word about the release of the device in other countries. The device sports an LED-backlit 13.3inch TFT LCD WXGA screen which is able to provide 1366x768 pixels of resolution. It is also added with the Intel HD 4000 graphics controller which will enhance the video performance. It will run in an Intel Core i7- 351U processor with a clock speed of 1.90GHz and will be powered by Windows 7 Home Premium 64-bit Operating system. For storage it will have a 256GB SSD and will have a 4GB DDR3 RAM. For extension of memory the users may opt for expansion from a 2-in 1 card reader for an SD card or a Multimedia Card. Other peripherals that are included in this model are Wi-Fi IEEE 802.11a/b/g/n, Bluetooth 4.0+HS, HDMI port, two USB 2.0 port and 2 USB 3.0 port, and a Thunderbolt port. The device is powered by a 4 cell battery which is expected to provide a battery backup of up to 6.5 hours. As this device is an Ultrabook so it also fulfills the slimness of the Ultrabooks, as its dimensions measures about 11.2mm (0.44inch) x 15mm (0.59inch) x 324.4mm (12.77inches) x 227.3mm (8.91inch). It weighs also very less that is only 1.2Kgs (2.645pounds). There are a several exclusive features with this device such as Acer Instant On, which allows the device to resume from sleep in only 1.5 seconds. Another of its feature is Acer Instant Connect, which enables users to go online in as little as 2.5 seconds.